Looking to successfully navigate raw materials markets? Do you ever struggle to formulate for different end-user requirements? Does market fragmentation and competition make strategizing a challenge? The last El Nino event caused shortages of oleochemical supply, leading many manufacturers in Asia to consider synthetic feedstocks. Since 2016, the gap between the palm and crude oil prices has narrowed, easing the pressure on sourcing raw materials. Yet additional synthetic capacity in the US and Middle East is likely to be targeted at Asia, affecting the balance. Addressing competition through innovation and the creation of novel formulations has gained momentum in a variety of applications areas, including personal and home care, industrial, agriculture, oilfield and coatings. Understanding the desires of key consumer groups – for example affordability, performance, environmentally-friendly or mildness – all affect surfactant or feedstock requirements and is, therefore, crucial information for success. Moreover, the Asian market is highly fragmented; with China, India, Southeast Asia, North Asia and Australia all asking for different product types, leaving stakeholders with added strategic and investment challenges. With new environmental legislation in China, changes to import duties, sustainability certifications and technological advances, there is much to be discussed in the Asian surfactants industry. 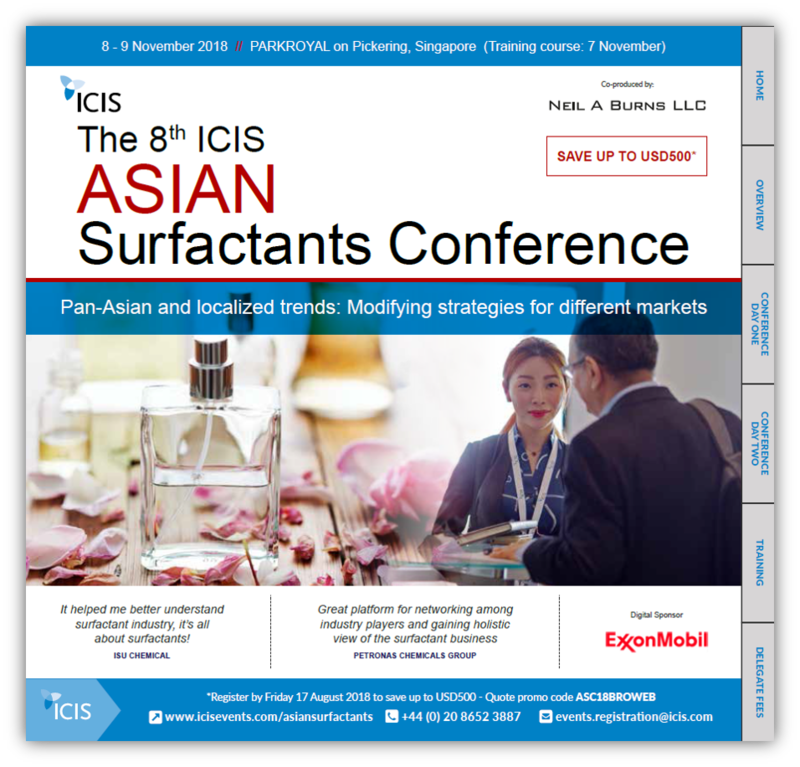 The 8th ICIS Asian Surfactants Conference will gather stakeholders from the whole value chain to understand pan-Asian and localized trends and learn how to modify your strategy for different markets. Join us in Singapore in November to take advantage of business-relevant content and exceptional networking opportunities. Surfactants Business Essentials is a one-day training course offering a non-technical view of the surfactants industry. The course will provide you with a sound understanding of value chains, costs and prices and where the opportunities and challenges lie, to help you make smart decisions in this sector. Maximize your time away from the office by attending the course just a day before the main conference.